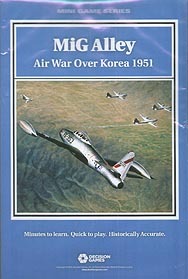 MiG Alley is a two-player game covering the air battles over North Korea in 1951. One player controls the UN forces and must carry out a series of bombing raids to knock out key targets in North Korea. The other player controls the Communist forces, including many of the new MiG-15 jet fighters, and attempts to inflict prohibitive losses on the UN. The game uses the Air Wars series rules. Aircraft are rated according to historical type. Fuel consumption is factored into the plane types, so a player must manage the available forces to ensure enough combat power is ready when needed. Each player has a unique set of campaign cards generating movement, combat bonuses, historical events, and reinforcements. Playing the right card at the right time is crucial to winning.